This two storey, three bedroom home with filtered bay views, is set in a peaceful bush setting, the perfect spot to getaway and unwind. Offering filtered waterviews from the front deck, with the added bonus of visiting birds, waiting for a treat. 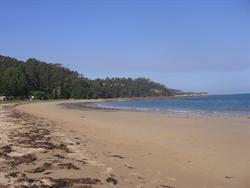 Longbeach beach is just 300 metres via shortcut. The large yard is ideal if you have a boat, plus a single lock up garage. Accommodating up to 6 with an extra shower and toilet, this is perfect for a family getaway or 2 families wanting to share the costs. This is BYO Linen (sheets and towels). Living, dining, kitchen, main bedroom, bathroom and toilet are located upstairs. There are two bedrooms extra shower, toilet and laundry downstairs. 3 bedroom; with Queen bed in main, double bed in second room and and two single beds in third room, sleeping a total of 6 people. Fully self contained house with leafy outlook and good appointments throughout. This two storey, three bedroom home with filtered bay views, is set in a peaceful bush setting, the perfect spot to getaway and unwind. Offering filtered waterviews from the front deck, with the added bonus of visiting birds, waiting for a treat. Longbeach beach is just 300 metres via shortcut. The large yard is ideal if you have a boat, plus a single lock up garage. Accommodating up to 7, with an extra shower and toilet ,this is perfect for a large family getaway or 2 families wanting to share the costs.